Gold! A popular color palette being chosen by our 2015 brides! From invitations, to gold accessories, to gold accents, gold is the up and coming trend. By incorporating gold into your wedding, you can create a sense of elegance and sophistication that will look absolutely flawless. 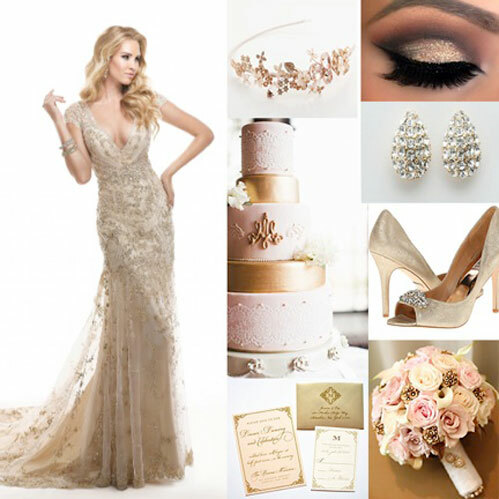 Above are some of ways that you can incorporate gold into your wedding. *All items can be found at Bucci’s Bridal, located in Pewaukee, Wisconsin. The gold trend is here to stay. It is the perfect neutral and glistens beautifully. We hope you enjoyed our insight to what we believe is one of the biggest trends of the year.